An Expert’s Guide to Top 101 Entry-level Jobs for MBAs and Graduates identifies job roles that will create nearly 2 million new entry-level vacancies in the next six years. Analyses of the data released by the National Skill Development Corporation reveals that these corporate jobs will benefit a plethora of aspirants, including those with qualifications such as BE, BTech, BA, BCom, BSc, BBA, BCA, BPharm, BL, as well as MBA, MCA, MBBS, CA, ICWA, CS and diplomas. Bestselling author T. Muralidharan is one of India’s top recruiters and career columnists. In his first book, he revealed how many job seekers go for the first available job only to regret joining within months and also how taking up the Right First Job (RFJ) can be the secret to reaching the top. In this book, he goes far beyond identifying the top jobs by helping readers understand the job roles in the context of how organizations work, answering crucial questions such as: What responsibilities does the role entail? What are the skills required? What will the stress levels be like? What salary can you expect? What are the career prospects? 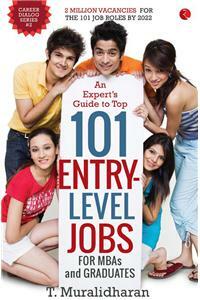 With practical insights and contemporary data, this first-of-its-kind book to hit the Indian market will help you find the right job and drive your career firmly to the top. A graduate of IIT Chennai and IIM Ahmedabad, T. Muralidharan is a first-generation entrepreneur and Founder-chairman of the TMI Group, one of the top five recruiting firms of India. Since 1991, Muralidharan and the group have helped over 100,000 professionals get jobs in the private sector. A regular speaker on various national forums, his articles on issues relating to education and employment can be read in a number of leading newspapers and magazines, including The Hindu, The Week, and Sakshi. He is a member of the National Board for Micro, Small and Medium Enterprises (MSME), Government of India; a national board member of the Federation of Indian Chambers of Commerce and Industry (FICCI); former Co-chair of FICCI Skill Development Forum; and the Founder of JobsDialog, India’s first mobile-based recruitment platform exclusively for small and medium enterprises. To know more, visit www.careerdialog.com.